by Javier, April 30, 2017 in ClimateEtc. 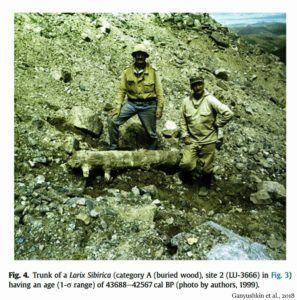 First in a two part series on Holocene climate variability. 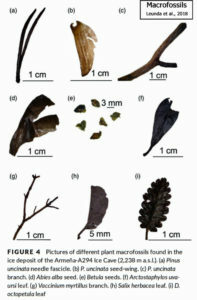 Figure 36. 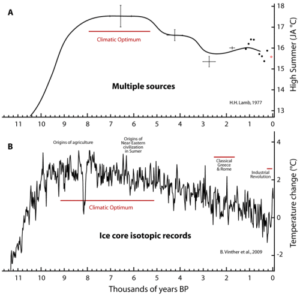 Holocene temperature profile. A. Summer (July-August) Central England temperature reconstruction from multiple proxies and sources by H. H. Lamb.Crosses represent dating and temperature uncertainty. Black dots are centennial averages. Red dot is 1900-1965 average. Source: Lamb, H.H. 1977. Climate: Present, past and future. Volume 2. B. Greenland temperature reconstruction based on an average of uplift corrected δ18O isotopic data from Agassiz and Renland ice cores. This average has been corrected for changes in the δ18O of seawater and calibrated to borehole temperature records. Some historical periods are indicated. Source: B. Vinther et al., 2009. 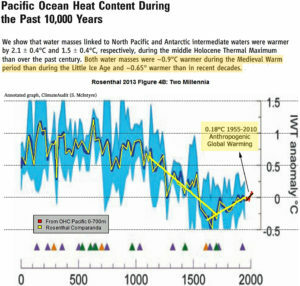 Earth’s surface has undergone unprecedented warming over the last century, and especially in this century. Every single year since 1977 has been warmer than the 20th century average, with 16 of the 17 warmest years on record occurring since 2001, and 2016 being the warmest year on recorded history. A study from 2016 found that without the emissions from burning coal and oil, there is very little likelihood that 13 out of the 15 warmest years on record would all have happened. 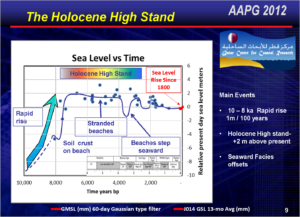 There seems to be a general acceptance about overall sea level trends during the Holocene. 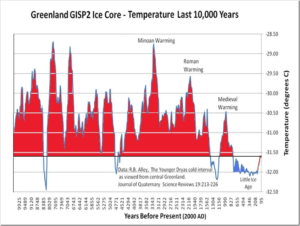 There was naturally a very rapid rise in sea levels at the end of the ice age, until 6000 years ago, since when the rise has been much more gradual. Some research puts the rate of rise in the last 2000 years at 0.07mm/yr, and this reflects the fact that ice caps left over from the ice age are still melting, rather than that the world is warmer than before. However, the impression is often given that, until the 20thC, this rate of rise has been pretty steady. This is despite the fact some of the authors of the above studies have warned of the existence of significant short-term fluctuations in sea level such that the sea level curve might oscillate up and down about this ~1 kyr mean state. [The above graph is based around 1000 year averages]. 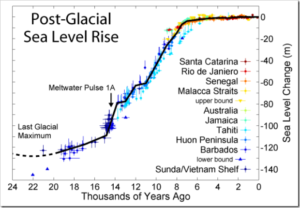 1) The most rapid phases [of sea level rise] were between 8000 and 5000 BC, and that the rise of general water level was effectively over by about 2000 BC, when it may have stood a metre or two higher than today. Booker commented the other day how one scientist claimed last week that we now have “the highest temperatures on Earth since the last ice age”. The BBC failed to even challenge this statement. This certainly is not the first time I have heard claims (presented as fact) to this effect. Obviously we had no thermometers around in those days, so nobody knows what the average temperature of the Earth was then. There again, nobody really knows now either. This study reveals that animal fats preserved in pottery vessels from the United Nations Educational, Scientific and Cultural Organization (UNESCO) World Heritage site of Çatalhöyük recorded the abrupt 8.2-thousand years B.P. climatic event in their hydrogen isotopic compositions. In addition, significant changes are observed in the archaeology and faunal assemblage of the site, showing how the early farming community at Çatalhöyük had to adapt to climate change. 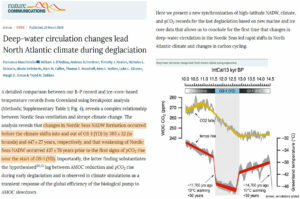 Significantly, this contribution shows that individual biomolecules preserved in ancient animal fats can be used to reconstruct paleoclimate records and thus, provides a powerful tool for the detection of climatic events at well-dated onsite terrestrial locations (i.e., at the very settlements where human populations lived). A new study published in Geophysical Research Journal shows that the so-called Little Ice Age — a period stretching from 1500 to 1850 in which mean temperatures in the northern hemisphere were considerably lower than at present — exerted effects on the climate of South America. Based on an analysis of speleothems (cave formations) in the Brazilian states of Mato Grosso do Sul and Goiás, the study revealed that in the seventeenth and eighteenth centuries, the climate of southwestern Brazil was wetter than it is now, for example, while that of the country’s Northeast region was drier. The same Brazilian cave records showed that the climate was drier in Brazil between 900 and 1100, during a period known as the Medieval Climate Anomaly (MCA), when the northern hemisphere’s climate was warmer than it is now.